France: Lens homeless next season? Redevelopment of Stade Bollaert-Delelis ahead of Euro 2016 will force RC Lens to play outside their home city. Authorities in Lille and Valenciennes would welcome the club at their new stadiums, but host clubs in both cases strongly oppose the move. An info-stades.fr report. Stade Bollaert-Delelis will become one of Euro 2016 host venues, but has to undergo a significant facelift first. This in turn means that RC Lens need to find an alternative stadium for the 2014/15 season. The club allready approached nearby municipalities of Lille and Valenciennes. In both cases the response was positive. 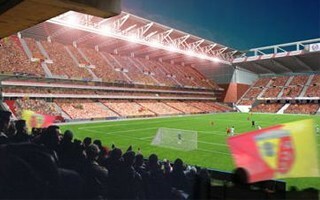 Also the operating companies behind Stade du Hainaut and Stade Pierre-Mauroy agreed for Lens to use the venues. However host clubs at both stadiums formed a strong opposition. FC Valenciennes fear that cohabitation with Lille might mean serious damages to the football field. Lille OSC president Michel Seydoux argues it would be too risky to host the derby rivals in Lille. „That's their problem. There's a comprehensive study on the problems it can cause. This is extremely complicated. I explained to president Martel that it was almost impossible to play at our stadium. This is not a thoughtless response. I understand the problem very well. I hope he finds a solution. And there are plenty in the area”, said Seydoux last weekend, quoted by info-stades.fr. Contrary to Seydoux's words, it seems that there is actually no serious alternative to the two above-mentioned stadiums. They are the only two large and modern enough within a 100 km radius. Rugby-athletic Stade Lille-Metropole is seriously outdated and would also mean sharing the field with a rugby league side, meaning even worse conditions than in Valenciennes. Some comments are very critical towards both FC Valenciennes and OSC Lille. It's said that both clubs fear being overshadowed by RC Lens, who remain the region's most popular club. Lille may be on the rise, but the fact that Lens have attendances of 28,000+ in the second league couldn't come unnoticed. Especially with the team being on its way to gain promotion.